People have been held under the Act after being charged with a wide variety of crimes, some minor and some very serious. The alleged offence which led to each person’s initial custody order is listed in the table below. Where people were held under the Act for multiple offences, only the most serious offenceis reported. Forty per cent of people held under the Act were accused of committing murder and attempted murder. In all of these cases the person had a mental illness. Most of the people under the Act for murder or attempted murder (88%) were acquitted due to unsound mind, rather than being unfit to stand trial. 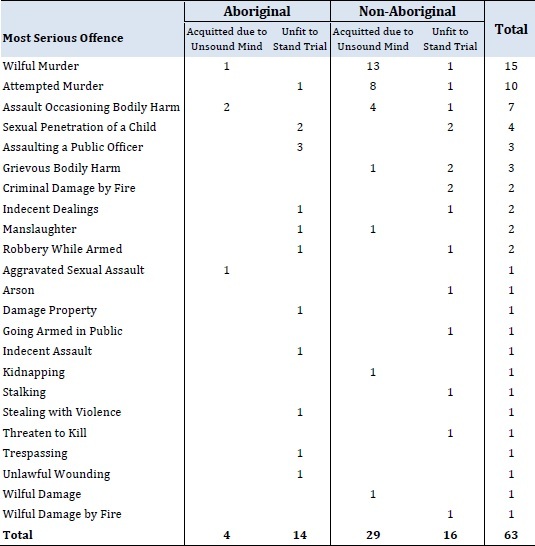 The overwhelming majority of people held under the Act for murder or attempted murder are non-­Aboriginal. Only two Aboriginal people have been held under the Act for murder or attempted murder compared with 23 non-­Aboriginal people. More generally, Aboriginal people are being held under the Act for less serious offences than non-Aboriginal people. All of the individuals whose most serious alleged offence was assault occasioning bodily harm or grievous bodily harm had a mental illness. However in the case of alleged sexual offences, people with a cognitive impairment were over-­represented, constituting around 75 per cent of such cases.